Matthew 24:24 For false Christs and false prophets will arise and show great signs and wonders, so as to lead astray, if possible even the elect. We bring no signs or wonders, nor do we claim to be Christs or prophets, but simply bear the same truth that Jesus bore in the season that he promised. We come from the same kingdom that he came from and bear witness to his teachings. Our Father’s kingdom is reached only in the way that Jesus taught and demonstrated. Rev 22:17 And let him who is thirsty come, let him who desires take the water of life without price. Rev 14:1-5 Then I looked, and lo, on Mount Zion stood the lamb, and with him a hundred and forty-four thousand who had his name and his Father’s name written on their foreheads. And I heard a voice from heaven like the sound of many waters and like the sound of loud thunder; the voice I heard was like the sound of harpers playing on their harps, and the4y sing a new song before the throne and before the4 four living creatures and before the elders. No one could learn that song except the hundred and forty-four thousand who had been redeemed from the earth. It is these who have not defiled themselves with women, for they are chaste; it is these who follow the Lamb wherever he goes; these have been redeemed from mankind as first fruits for God and the Lamb, and in their mouth no lie was found, for they are spotless. If you could project your mind out into the heavens and look at the positions of planets and other solar bodies in this immediate solar system, then extend your observations even more distantly, you might not be able to see the actual physical manifestation of energy; but if you were sensitive you would be aware that there is at this time an intense energy source focusing on this planet. How severely this energy is affecting other planets in this solar system, we don’t know – and it is not important to us. This energy focus might be more clearly understood if you picture a searchlight that is circling in the far distant heavens without interference from other bodies in the heavens, clearly shining on this planet as it did approximately two thousand years ago in it’s last orbiting. Another way to picture this same energy field would be to imagine a very distant emission of energy that has been obstructed from this planet by the positional interference of other solar bodies. At this time it is as if an opening or a shaft has been made by the present position of the heavens, permitting a strong intensity of that energy field to focus directly upon Earth – as it did approximately two thousand years ago. It really does not make any difference what the actual cause or reason behind the energy focus is. But to be aware of its presence – and thereby understand why the life forms on this planet are responding the way they are – is significant, and will be helpful in understanding and controlling one’s own individual response. When this planet came together and was formed by members (or a particular member in that level-above-human) whose responsibility or chosen endeavor was the creation of a new garden, it became the place where germination could begin and life forms could multiply. If the life forms survived all the intermediate lesson-steps of growth, they could work their way up to the human level. Now at this particular time, when an intense energy source is striking the planet, graduation from the human level into the level-above-human, or the kingdom of God, is made available. The Earth garden has had life forms survive in growth-motion into the human kingdom in previous civilizations. However, at the time when the availability was offered, those previous human civilizations were not able to make it through the transition from human to the level-above-human. A lot of growth in levels-beneath-human seems to be more automatic in upward motion, for the strength of will that pushes the life form up a notch is, for the most part, not consciously aware of what it is doing when it graduates upwardly. At the human level, schoolchildren in the early grades are not consciously aware that they have grown by their choice. However, at the growth level where a human becomes a prospect for the next level (the level-above-human) he must be completely aware of what he is doing or he cannot complete the transitional experience. It might be helpful to consider how graduation from one level to the next is deserved or reached. A dog who has become tired or disenchanted with the so-called normal activities of the dog world and finds his only pleasure in pleasing his master deserves to move out of the dog kingdom and into the beginning stage of the level that he chooses to serve. Some dogs might accept the training to avoid punishment. Their motivation would not make them deserving of graduating into the kindergarten of the human level. But the dog who desires only the attention, approval, and affection of the human, whose motivation is genuinely that of seeking to be associated with the next level (or human world), deserves to move into that higher level when graduation time arrives. The energy focus that is now on planet Earth is the energy needed for the graduation experience. The human who desires only to please and to serve the level above his kingdom can at this time, with the help of members of the level-above-human, receive his examination, roll call, depart from his school (Earth), go “out in the world” – into the literal heavens among other members of the kingdom of God – and begin his apprenticeship and chosen activities. The man who teaches a dog must hold frequent training sessions or the dog will quickly forget his training – though he may continue to seek a close, affectionate relationship with the man. A human college student must have an increasingly distant relationship with his professor and come into his own knowledge if he hopes to one day be in a professional capacity. A candidate for the level-above-human must have an even more distant physical relationship with his teachers, or the members of the kingdom-above-human. For the requirement of his graduation includes a mental teaching program and a willingness to complete that program before gaining physical contact with the teacher level. Because of this extremely infrequent physical contact, most religions have adopted the belief that members of that next level do not have physical bodies. The human professor does not seek out his students to impose his teachings; rather, they pay for instruction and choose to go to his classroom because society imposes the idea upon humans that they must find themselves in classrooms. A prospective candidate for the next level has to do all of his seeking from the minds of his teachers in the next level through the strength of his own volition, according to the intensity of his thirst for knowledge above human. Now, at the same time that this intense energy focuses or shines on this planet, members of the level-above-human come in at close range to examine the garden (most especially the human kingdom) and assist in the graduation. In preparation for the rare graduation period, a member or members of that next level might have chosen to leave their physical bodies, incarnate in the offspring of woman, lose the conscious minds they had attained, and live a seemingly normal human existence for a number of years – though close associates might have realized there was something different about them. At the point in time when the energy focus became very intense, these people went through a period of mental transition, they became aware of the fact that they had come from another level and that they had spent a part of a human life in order to be at closer range with prospective graduates. The teachers can now tell and show how the changeover from a human into a member of the next level is accomplished. They may even demonstrate to nonbelievers that upon completion of the changeover they have become creatures capable of repairing a so-called “dead” body in three and a half days. It was earlier stated that civilizations have existed on this planet that were unable to rise above the highest human condition. The present civilization, which began approximately six thousand years ago, has been the recipient of special help from the level-above-human. Members of the level-above-human chose to incarnate several times into this civilization in order to assist in bringing it up through its different “grades” in the human “school.” This was not in order to upgrade genealogy or physical bodies, but to associate with the souls who are the products of this garden so that they might have someone with a higher consciousness in their midst to serve as an example. The individual who was called Adam came to Earth from the heavens (the kingdom-above-human) in his total form – physical body and mind. He was so overcome by the discarnates (invisible life forms) from the previous civilizations that he was not able to withstand the aggression of their influences. Adam thereby temporarily lost his heavenly consciousness (the capacity of the mind of an individual in the next level) and found himself in the decaying vibration of the human level. This led to his death. It was not until his incarnation in the individual named Enoch (who was the second major help) that he was able to rise above human-level vibrations and thereby resume his mental capacity as a member of our Father’s kingdom. This awareness permitted him to serve in the function of assisting in the bringing up of early-grade humans who were products of the Earth’s garden. After Adam-Enoch had left adequate upgrading teachings, he was in sufficient mental communication with members of the level-above-human to complete his total conversion back into a rightful member of that level and depart from the human world and the Earth’s surface without experiencing death. He took his whole mind and body with him. This is to say that Adam was brought to Earth’s surface from the kingdom-above-human (the kingdom of God) to begin a new civilization. He yielded to the temptations of the human-level sensuality, and in so doing he decreased his knowledge, the expanse of his mind, to that of a human-level creature. In a sense Adam lost what he had previously gained, and he did not begin to recover it to any significant degree until his incarnation as Enoch. As Enoch, Adam completed his changeover, physically and mentally, and left the Earth’s surface to reenter the kingdom-above-human. After a season of growth, a third help-mission was sent to this particular civilization. But this time, in order to understand and to relate to the level of growth of the civilization, a member of our Father’s kingdom left his heavenly body in the spacecraft that brought him to the Earth’s surface and entered the newborn body named Moses. Upon entering the baby’s body, the mind that had been in the level-above-human had to be as restricted as the child’s vehicle. In a sense, that mind had to go to sleep and reawaken as soon as the body of Moses had encountered enough experiences of growth and suffering to realize he had extraordinary work to do. It was his accepted responsibility before coming down to Earth to upgrade the civilization several grades beyond what had been offered by Enoch. Using an analogy of twelve grades in school related to twelve steps of human growth in a civilization, it was Moses’ chosen mission to set rules of order which, if adhered to, could elevate man’s growth to fifth- or sixth-grade students in the human school. Moses, like Enoch, later in life changed from his human condition into a body and mind that could return to the level-above-human. When his work had been completed he did not leave a human body behind, but took his changed-over body with him. The fourth significant help for this civilization came at the next major “spring” when a member of our Father’s kingdom, or the fourth mission of the same member, occurred. An individual (incarnate as Elijah) came to Earth’s surface and served in a capacity similar to Moses’. The information that he brought was again designed to upgrade or to assist this civilization, particularly those who had grown to the point that as individuals they were seeking to begin to rise above what they had gotten into. Elijah’s information was structured for those who were moving away from their densest or broadest accumulation of human attachments – reaching for grades seven or eight. Of equal importance, Elijah’s information sought to prepare the growing members of this civilization for the next help that would come (in Jesus), which would actually give the information for graduation from the twelfth grade (human level) altogether and show humans how to enter the kingdom of God. Never has any heavenly information been accepted by the masses as a whole; rather, it is accepted by the few who seek to change out of their last station of growth. Masses or groups of people do not grow or move up automatically. Growth is done individually, according to the degree of thirst for upward motion in the individual. The next major help, or fifth upgrading mission, from the kingdom-above-human brought the civilization applicable information about how an individual product of this garden might change sufficiently to leave the human kingdom literally and take his total being, mind and body, with him into the kingdom-above-human. This is to say that the individual who came to fulfill this fifth mission took the incarnation labeled Jesus in the same manner that the individual of the third mission incarnated as Moses, and the fourth as Elijah. Jesus’ mission was to tell and to show how human products of this garden who had risen to the point where they were seeking the kingdom of heaven could reach it. But even though their comprehension of the changeover task was sufficient for them to begin to receive the information, their capacity for applying the formula of overcoming, or changeover, was lacking. This is not to say that anything was lost by those who were applying Jesus’ teachings, for those same souls are here again now at this sixth help season in order to complete what they had started with his assistance. The one who was named Jesus not only had, after his awakening, the responsibility of telling and showing how the literal changeover from a human being into a heavenly being is accomplished – he also had the added task of demonstrating that one who had changed over can re-heal his body in three and a half days if he is destroyed. Since the masses of people in this civilization did not desire upward growth sufficiently to reach for information Jesus brought, they found themselves in a growth condition that was blind to his truth. They had not the capacity to accept him; therefore, they rejected him to the point of desiring his death. Since the slow growers chose to kill him, Jesus’ mission included a “proof-demonstration” for the unbelievers. This did not mean that any others who might complete their changeover would need to be, or even asked to be, the instruments of such a demonstration. None of this is to say that efforts towards growth and upward-reaching endeavors that took the form of religious movements were not the best for which men had the capacity at their station of growth. Ultimately the information for which all souls who seek to grow upward are looking is information on how to graduate into the next kingdom. It makes no difference which path you take up the mountain, what pursuits of knowledge – scientific or religious – you choose. All can lead to the top if your thirst remains unquenchable and you are dissatisfied with the level you have obtained. However, when you have reached the top of the mountain, you must discard all the discoloration and terminology accumulated in your upward climb and come into an unvarnished, unromantic understanding of the requirements of “liftoff.” Therefore, there is only one way to reach the kindergarten in the kingdom of heaven. It was knowable at this time of Jesus’ mission if one could understand what he taught – not what others said he taught – and is knowable at this time through the information that it is our responsibility to clarify. The sixth major help period for Earth’s human garden is now. The truth brought by us is one hundred percent the same truth brought in the mission of Jesus. Our responsibility is to reunite your minds with the proper interpretation of what he had to say – if you seek it – and to help you understand that only in the same way that he changed over in order to reenter the kingdom-above-human can you become a member of that level. When Jesus said that everything that I am you can become and much more, he meant it. It is true. Once again we are in a brief season when the “light” or knowledge or “energy focus” is on this planet. It is brief and intense. Many who have not chosen upward motion may respond adversely and even destroy themselves. Some – you, we hope – will realize that now is a brief period for your preparation to leave the human kingdom. The seventh closeness will not be a teaching one, but a gathering of the harvest of those who have overcome this world. Those who literally and physically rise up to join him away from the surface of the Earth will be a part of the “rapture,” and they at that time will become full-fledged members of that kingdom. If they have not completed their total effort as individuals in overcoming this world and all of their individual attachments to it by the time he comes in this seventh closeness, they will not receive that ingredient from the kingdom of God. If they have given their full effort toward total overcoming from the time their minds receive this clarification of changeover requirements until the seventh closeness, they will receive that final ingredient and become whole “in a twinkling of an eye” and be capable of moving and serving in the literal heavens as much as the butterfly is capable of moving it it’s world as compared to it’s limited capabilities when it was but a caterpillar. None of this, if you desire to be a full recipient of what this information has to offer, can be taken as a concept for study, religious belief, or some new idea of an avant garde cult. The teachings that are contained here – if they speak to you and if you choose to accept them – must be applied to the activities in your life to the extent that very soon in your individual life you will have only one thing in mind – reaching our Father’s kingdom during the short time it is available to you and seeking his help in the total overcoming of this world, having been weaned from all your humanness so that you might be one of those prepared to meet him. 1) There is a literal, physical kingdom of life above the human level. 2) That kingdom level exists in the literal, physical heavens outside the Earth’s atmosphere. 3) It is from humans changed over that members in the next level get their physical birth. 4) The season for that changeover comes rarely and brings with it the necessary assisting information through the minds of members of that next level, who incarnate as humans during that season in order to bear the information of how the changeover is accomplished. The bearers also serve as examples or specimens, illustrating that physical changeover accomplished. 5) Human candidates for the individual change-over can accomplish it only during that brief season. 6) These candidates must be in physical bodies of strong will, be mentally alert, and be in full control of their total selves. During the time of your preparation and change-over, you must guard against the misdirection of your energies. At the top of the list, your first desire must always be to reach the next kingdom. You can not enter if you have not become an individual who has the characteristics of others who are already members of that kingdom. At the core of your motivation must be the desire to be good and right to a degree not comprehendable by humans. Your greatest pleasure then becomes the pleasing of your Heavenly Father. You must know who your Heavenly Father is. If he is from the real heavens, and you know him, then you will always try to stay in tune with his mind and handle each circumstance as you believe he or his Father would handle it. Your emphasis must remain on telling others that the real kingdom level of the real heavens exists, and that now a brief time exists for individuals to become members in it. If you emphasize the demonstration, you participate to a degree in the “show-me” point of view. If the demonstration occurs prematurely, those changing over will find themselves without close assistance, and could easily be misdirected. “Sticking it out” or “just waiting for the spaceship” won’t accomplish your desired change. You have to be willing to accept the possibility that your “chrysalis” might take as long as ours took. Only continuous pushing and pressing forward will complete your changeover. This pressing includes “doing your Father’s work,” i.e., daily doing all that you can to spread the good news of the real kingdom of God. You must be determined to not allow anything or anyone to turn your head from your completion task. There will be many who would delight in seeing you turn back in order to justify their weakness. Warning: There are artificial circumstances, objects, and indivduals who would woo you away from the real. This is true of aspects on every level – even “spacecraft” and “angels.” Be alert – know the difference. As predicted and even like clockwork here is another Comet that has the folks at NASA and JPL and ESA and everywhere else as they say “Puzzling” and “scratching their heads”. And in this blub they are still calling it an “icy visitor” yet not much bigger than a “comet-boulder” another new term, so how does a ball of ice and rock survive Sun temperatures. 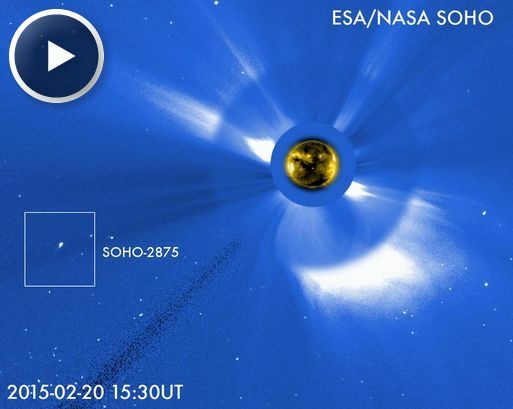 They can’t claim it didn’t survive the sun as they did with the 2013 September comet ISON. (It did survive the sun though the media didn’t cover it as that’s not really supposed to happen to an icy rock). First I will post what Spaceweather.com posted and then what I found on youtube that is much more revealing what even looks like a “flying saucer” shaped “comet”, but don’t take my word for it, look at the video and watch all the progress and reality deniers squirm to come up with explanations and debunking for fear of the truth. If it’s not a comet after all, then the FACT that it’s much smaller and doesn’t act like comets begins to make more sense. Humans are being dummed down. Many are incapable of critical thinking though they will quote the academics past and are satisfied with illogical answers to the many observations that can not be denied by someone with any intelligence.